Breaking bindweed: Could sub-surface applications of trifluralin play a role in weed management in processing tomatoes? Processing tomato production in California has changed, dramatically, over the last half-century. Improved cultivars, conversion from seeded to transplanted production, commercialization of the mechanical harvester, and the steady adoption of drip irrigation have helped to expand the size and economic value of the industry. In 2013, California led the nation in the production of processing tomatoes in terms of hectares planted and harvested (105,000 ha), total yield (10 million metric tons), and total value of production ($918 million). The adoption of drip irrigation can reduce in-crop weed densities (small-seeded annual species) and, therefore, the need for subsequent cultivation. One weed that has been less impacted by the switch to drip systems is field bindweed (Convovulous arvensis), a deep-rooted and drought-tolerant perennial that can be difficult to control once it has become established. Results from previous research (Figure 1) conducted at UC Davis have shown that pre-plant applications of trifluralin (Treflan), rimsulfuron (Matrix) and sulfentrazone (Zeus) can suppress perennial bindweed vines (relative to an untreated check) for up to 4 to 6 weeks after transplanting (Note: these studies were conducted at the UC Davis research farm (Fine, silty loam (Yolo series, 37% sand, 41% silt, 22% clay; 1.5-3% OM; pH 6.7-7.2)) in the southern Sacramento Valley. Tomato transplants were sprinkler set and then furrow irrigated). Figure 1. Field bindweed cover at four weeks after transplanting. Results are a composite of five different trials conducted over the course of three years. UTC = untreated check, PPI = pre-plant incorporated, PRE = surface application pre-transplant. The successful control of deep-rooted perennials, such as field bindweed, is dependent upon herbicides reaching latent root and shoot buds. The majority of root/rhizome biomass for field bindweed is located within the top 2 feet of the soil profile, although some vertical roots can reach depths of more than 10 feet. Conversely, trifluralin and other residual herbicides registered for use in processing tomatoes are usually incorporated into the top 2 to 3 inches of the soil profile. Because of their shallow placement, these herbicides may not suppress bindweed vines that are emerging from deeply buried rhizomes. On June 1, 2015, we initiated a study to describe how sub-surface applications (Figure 2) of trifluralin (32 oz/A as Treflan), with and without surface-applied herbicides (trifluralin (32 oz/A), S-metolachlor (27 oz/A as Dual Magnum), and sulfentrazone (3 oz/A as Zeus)) affected field bindweed cover. Figure 2. 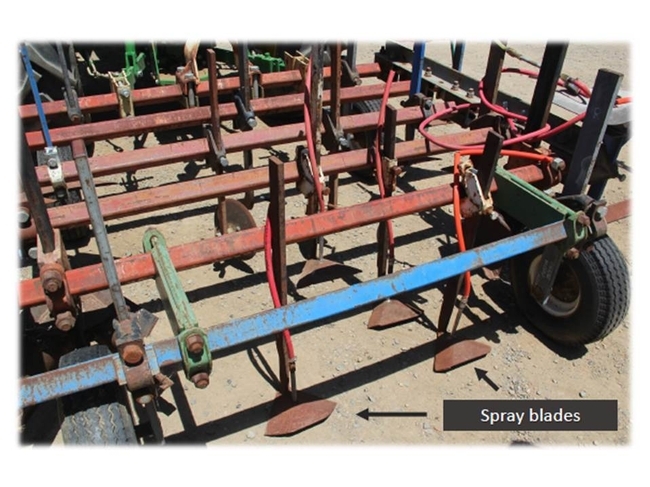 Image of the spray blades that were used in this study. The herbicide nozzles (VS 8002) were positioned on the underside of the blade (which could better be described as a wedge that lifts the soil allowing for the herbicide to be applied in a horizontal band under the soil surface (in the case of our study, at a depth of 4 inches)). The blades were positioned such that they allowed trifluralin to be broadcast, evenly, across the entire width of the bed-top or else banded along the bed shoulders, allowing for an unsprayed strip in the middle of the bed. A no SSL application (i.e. unsprayed) treatment was also included in the study. With respect to the sub-surface layered (SSL) applications of trifluralin (32 oz/A as Treflan at a rate of 40 GPA): the herbicide was applied broadcast at a depth of 4 inches across the entire width of the bed-top (4 blades with 6 inch spray patterns) or else applied banded to the outer 6 inches of each bed (leaving a 12 inch wide unsprayed strip (i.e. transplant row) in the center of the beds. There was also a no SSL trifluralin application (no herbicide applied at a depth of 4 inches). SSL applications were made 24 hours prior to tomato (Heinz 5508) transplanting. sprayer to bare soil and incorporated to a depth of 2 to 3 inches with cultivation. Surface applications were made directly following the sub-surface applications, and 24 hours prior to tomato transplanting. An untreated check (UTC) was also included. Tomatoes were sprinkler irrigated to set the transplants. The broadcast application of trifluralin (SSL) reduced bindweed cover (7 to 36%) relative to the no SSL check (10 to 50%), when average across all surface herbicides (Table 1). 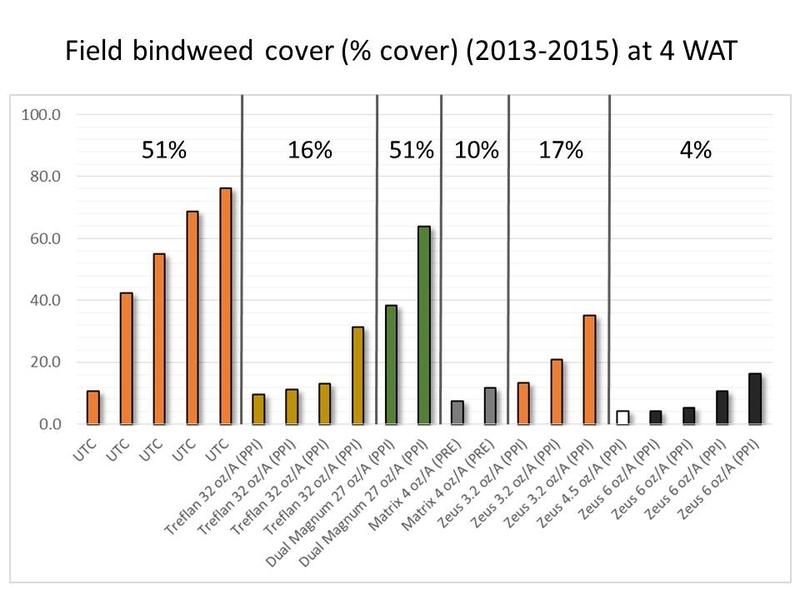 Bindweed cover (11 to 49%) in the banded application was similar to the no SSL treatment, when averaged over all surface herbicides (Table 1). When averaged over the SSL treatments, field bindweed cover was greatest in the untreated check (UTC) (6 to 66%), followed by S-metolachlor (10 to 47%), and trifluralin and sulfentrazone (5 to 34%) (Table 1). These results mirror those of previous trials (Figure 1). Table 1. 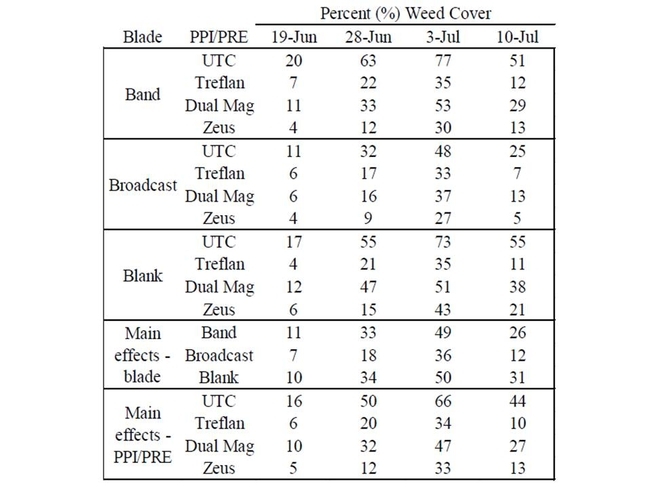 Field bindweed cover (%) between June 19 and July 10, 2015, in response to SSL applications of trifluralin (as Treflan at 32 oz/A) and surface applications of trifluralin (32 oz/A), S-metolachlor (as Dual Magnum at 27 oz/A) and sulfentrazone (as Zeus at 3 oz/A). Band = trifluralin banded along the bed shoulders, allowing for 12 inch unsprayed strip in the middle of the bed. Broadcast = trifluralin applied, evenly, across the entire width of the bed-top. Blank = no SSL application of trifluralin (i.e. unsprayed). Although bindweed seedlings are relatively easy to manage using physical and chemical control strategies, established plants with extensive root systems are relatively tolerant to most management practices. Perennial bindweed control with tillage and cultivation is made more difficult by the weed's significant below-ground nutrient reserves and regenerative capacity. Infrequent mechanical cultivation may also facilitate plant spread by dispersing root fragments as opposed to exhausting stored energy. Suppression of established bindweed using chemical tools may be equally challenging, especially in crops, like processing tomato, where effective herbicide options are limited. Results from our study showed that broadcast, sub-surface applications of trifluralin were able to suppress field bindweed, although both banded and broadcast SSL applications also injured processing tomatoes. We have recently initiated a similar trial (beginning in April 2016) in which SSL applications of trifluralin (broadcast and banded) will be made at multiple timings in advance of tomato transplanting to see if we can still reduce field bindweed cover while minimizing the risk to the tomato crop. This study is just one of many research trials that we are engaged in to improve our understanding of bindweed and bindweed control. Sub-surface applications of trifluralin are not currently labeled for use in California processing tomatoes. The mention of any herbicide product (or rate) in this blog post does not equal an endorsement and/or a recommendation. Always consult the herbicide label prior to any applications.